On August 29 2008, U.S. Senator John McCain announced that he was picking a little-known Alaskan governor as his vice presidential running mate. Four days later, Sarah Palin was at the center of an historic presidential campaign. It had been somewhat of a rough week for the newcomer. Let off their leashes at last by McCain's announcement, the press corps took off after all kinds of Palin stories, from a state ethics investigation to her daughter's pregnancy. On top of that, McCain had waited until nearly the very last minute to announce his pick, just four days before the Republicans were meeting for their national convention. McCain was trailing Senator Barack Obama in most national polls when he chose Palin for the ticket. Could she deliver the energy and votes that his campaign needed? The rest, as they say, is history--and not a happy history for McCain and Palin. But in her September 3 acceptance speech before the 2008 Republican National Convention, the new nominee was at the top of her game. 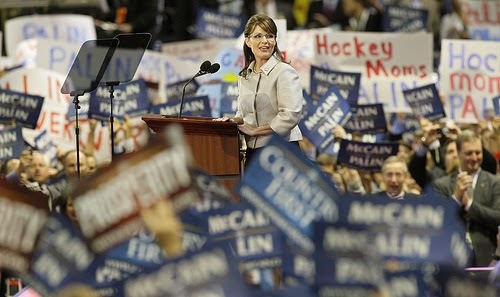 Palin waited for many long minutes at the podium in Minnesota before the fired-up crowd would let her speak. And when she finally began, she proved deft at handling both the inclusive themes of service and Middle America and the less friendly asides about the Democratic candidate. If you've listened to or even heard about this speech, I'm guessing you either love it or hate it, depending on your political leanings. But what can you learn from it? Speak to your strengths. Without knowing who the candidate would be, campaign speechwriter Matthew Scully had written most of the vice presidential nomination speech in the week leading up to the convention. When Palin joined the ticket, Scully chose anecdotes from her political biography that could be used to illustrate the broader themes that were already in place for the speech. With only a week to prepare, it was a smart move to use specifics that Palin already knew inside and out. You may not have a speechwriter working for you, but you can craft a speech that includes topics that are already in your comfort zone. Protect your best lines. Timing is everything on the convention podium. There's an enormous crowd ready to cheer at everything the candidate says, but she can't let them drown out the best one-liners and the graceful phrases that will be tomorrow's sound bites. Palin handled this challenge with tremendous poise throughout the speech. At some points, she used her hands to gesture in time with her words to "push down" applause. And in other places she had the patience to give her best zingers--like the famous one about hockey moms--a little pause to give the crowd time to settle down before delivering the punchline. Know your role. Vice presidential candidates are often called on to do the mud-slinging for a campaign, lest the presidential candidate's own hands get dirty. McCain couldn't have asked for a better slinger on that night. Her barbs aimed at Barack Obama's community-organizer experience, among others, were delivered with just the right touch of head-shaking exasperation, reminiscent of Ronald Reagan's great debate line, "There you go again." But they were also delivered with a flashing smile and sly sense of humor that made her the happy warrior that the Republicans had been hoping for on the podium.